Let’s take a look at my photos from November. What a great month it was! Lots of people photos again, plus a mini get away, Thanksgiving, plenty of good food and drink, and Jackie! And, as an added bonus, my November 1SE, too. Happy Monday and Hello, December! It was a great month . . . so much love and happiness in your photo collection. 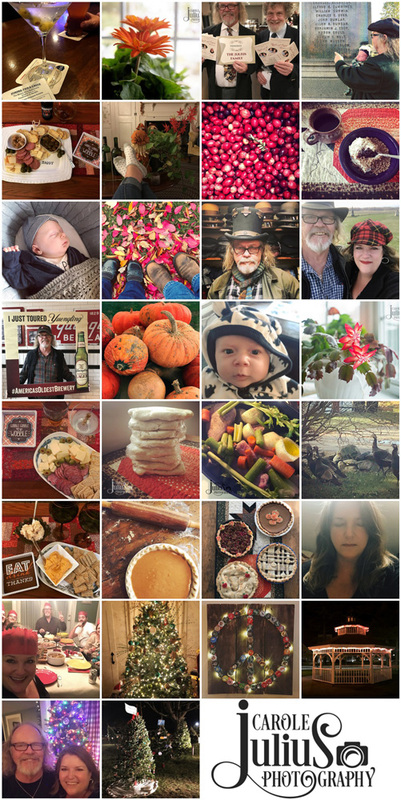 With lovely photos of cranberries and pies to trees and lights, this could only be November. I hope your December is even more beautiful! so much to be grateful for! I love the transition from fall to Christmas in the last week – bring on the twinkle!! I love all of the pictures of you and Dale too! Your photos and one sec a day videos are so fun, especially now that Jack’s part of the picture. I just love the video and I can’t believe how much Jackie has changed! So hard to believe November has come and gone!